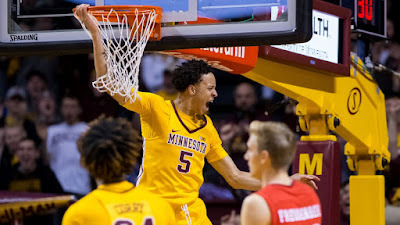 The latest iteration of the Gophers men's basketball team appears, on paper, to be a sea change from previous seasons. Refreshed by a youthful team (we're starting two freshmen, and zero seniors), the team has hustled and shot its way to a perfect 6-0. Unfortunately, they've done it against dubious competition. They've also done it in the friendly confines of Williams Arena. Tonight, our boys head down to Florida State to face a strong Seminole crew that was ranked in the top 25 last week. While the competition is not as tough as some that will be faced in the Big 10, the Seminoles represent the best test yet this season of how good these Gophers truly are. Regardless of the outcome, up to now it has been an entertaining season. This team plays hard - really hard. Amir Coffey is the real deal, and has flat dominated some games as a true freshman. Finally, Richard Pitino appears to have a team that is executing to his program's expectations. We'll see tonight if it is real or a mirage.